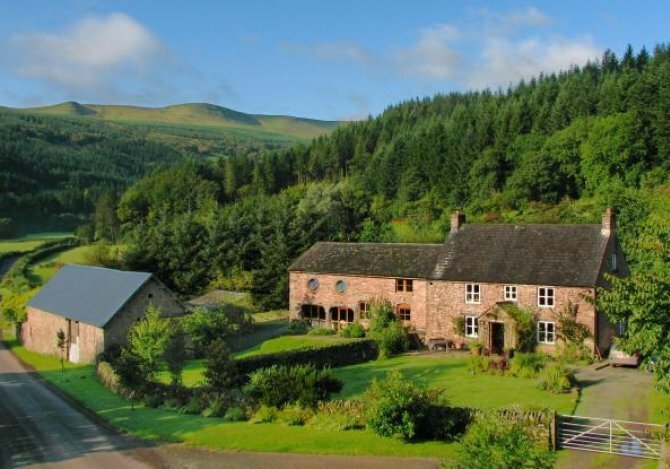 Abercynafon Farm Barn, Talybont-on-Usk, Powys, Brecon Beacons, sleeps 6-10 in 4 bedrooms. 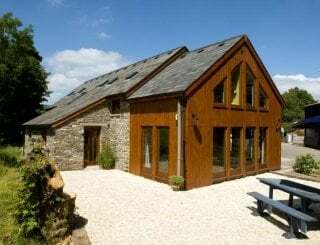 Recently converted with care and attention to the details, this is a beautiful and spacious 19th Century Grade II listed stone barn. 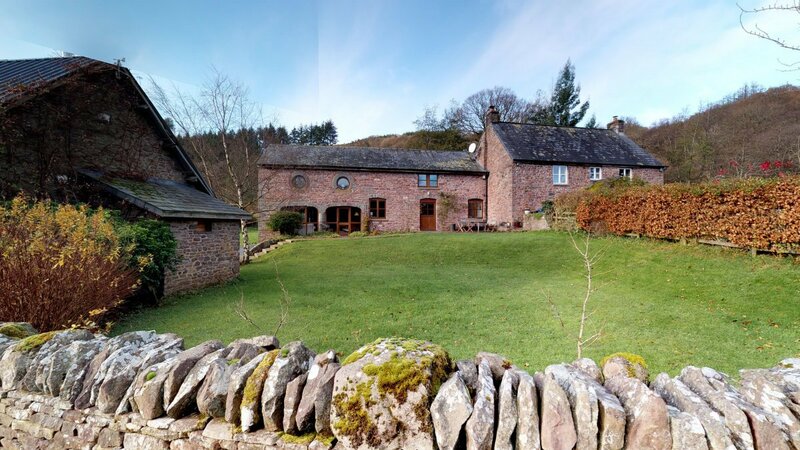 Although adjacent to the owner's farmhouse it provides privacy with its separate entrance gate, drive and garden. 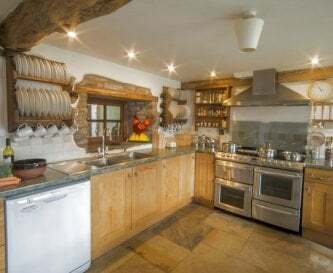 Under floor heating is provided throughout. All electricity is generated by its own micro-hydroelectric turbine using the stream that passes through the property. 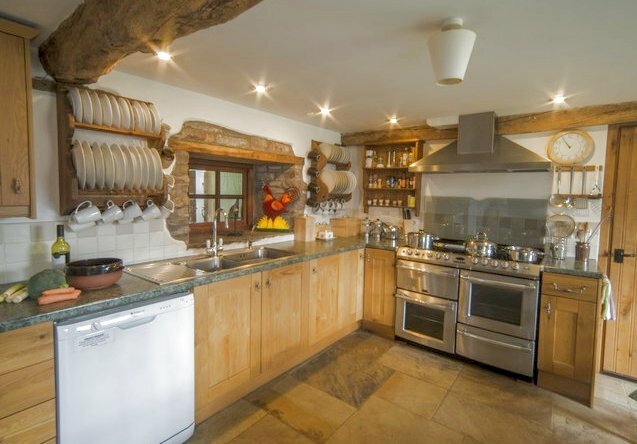 Spacious fitted kitchen with a large gas range cooker, microwave, tall fridge, dishwasher plus all you need to cook for a large group. The dining table can comfortably seat up to 14 people. Sofas provide more relaxed seating. 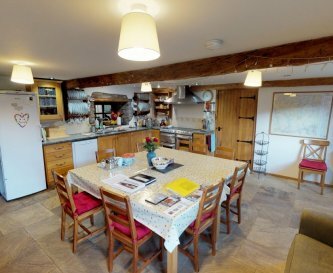 Off the kitchen is the large, oak beamed sitting room. 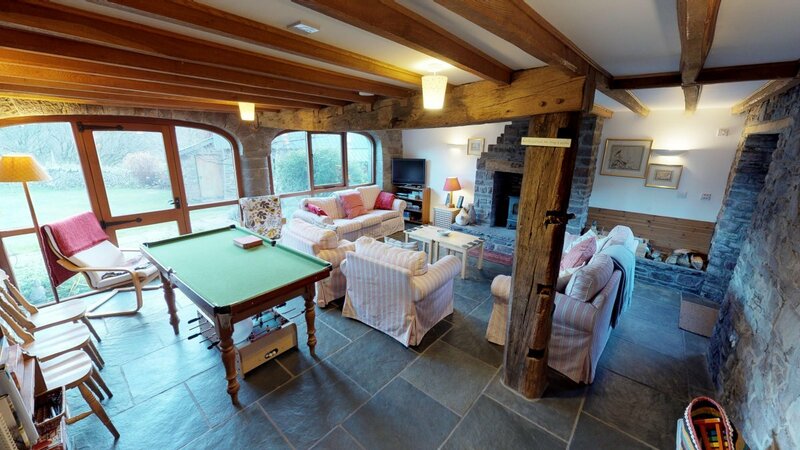 Relax in the comfortable sofas and armchairs in front of the wood burning stove. 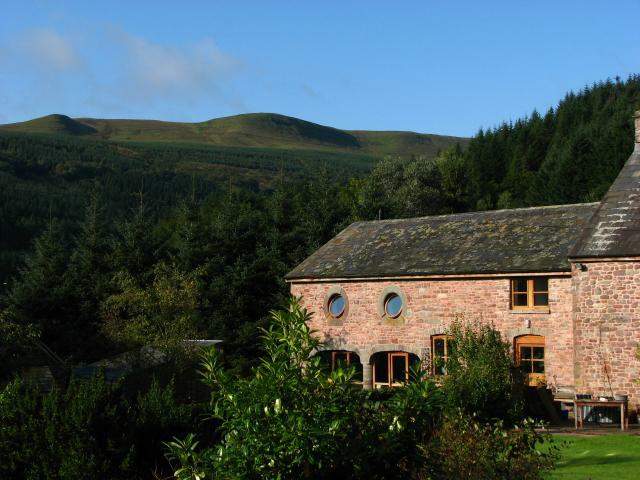 Through huge cart arch windows enjoy the panoramic views of the Talybont reservoir and surrounding hills. Double doors give access to a sheltered sitting-area with wooden table, benches and BBQ. Also off the kitchen there is also a good-sized utility room with a washing machine, freezer and additional storage space. Adjoining is a drying room for coats and boots, with a toilet and basin. 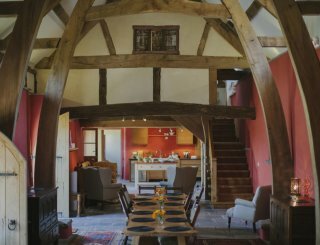 A hand-made, oak staircase leads to four large en-suite bedrooms. 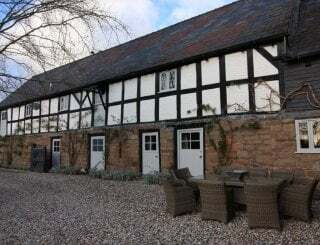 All bedrooms are beautifully renovated with great oak trusses and floors. Each has plenty of draws and clothes hanging space. 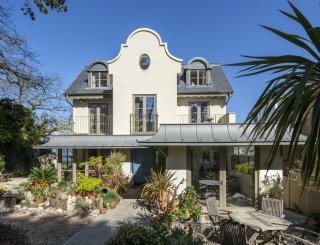 Attractive stone windows look on to the circular front garden and offer wonderful views in every direction. 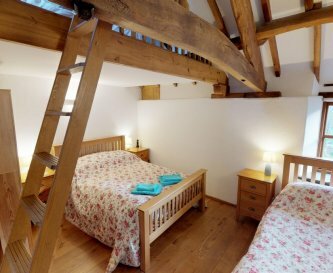 Bedrooms 1 and 2 each have an oak-framed double bed, a single bed and a ladder stair leading to a mezzanine sleeping area with a futon bed. Bedroom 3 has twin single beds. 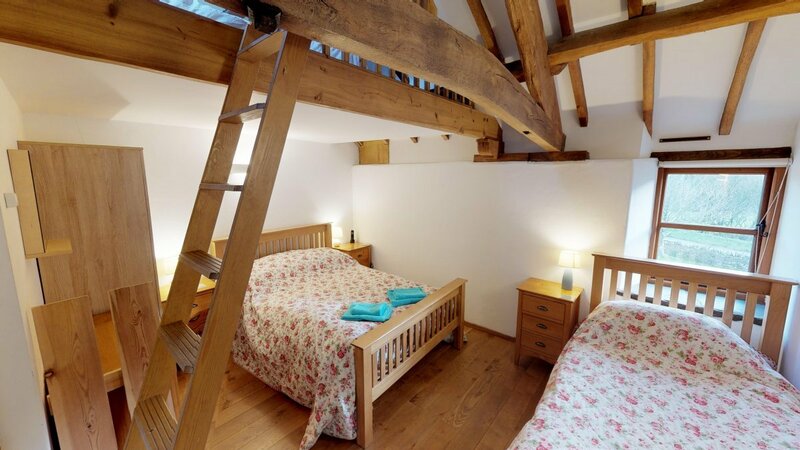 Bedroom 4 has a double bed and a mezzanine sleeping area with a shorter single bed. There are two separate toilets with basins off the upstairs landing. 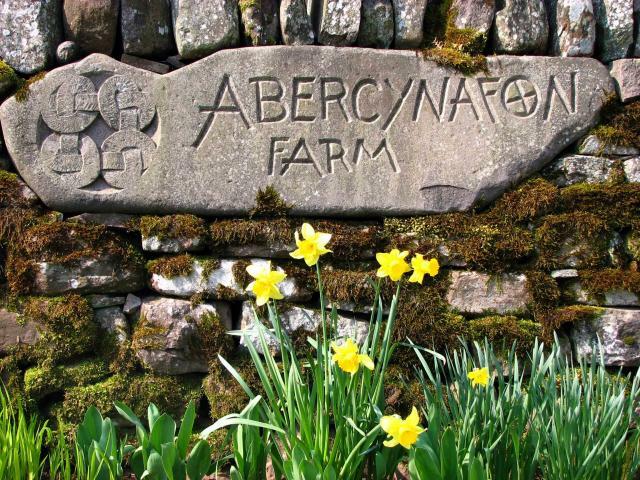 Energy efficiency, water-use efficiency, recycling and healthy living are all central to the ethics of Abercynafon Farm. 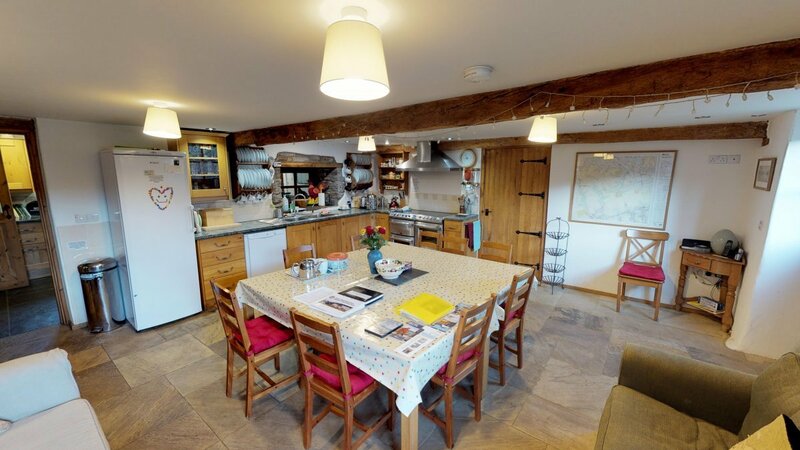 Please see the 3D virtual tour on our web site for more information. Well-equipped and newly fitted. Large room incorporating dining area, see below. Twin dining tables that can comfortably seat 14 people. One child's high chair. Two additional sofas. 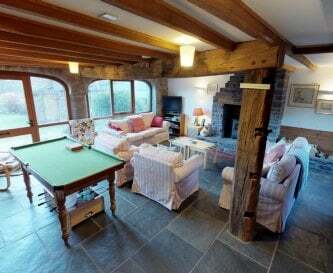 Lovely sitting room in which to relax. Two large sofas and other assorted armchairs. Wood burner, TV, DVD and a small sized snooker table. TV, DVD, MP3 player speakers and portable CD player. Sky box with basic service. No mobile coverage. Landline available in the kitchen. 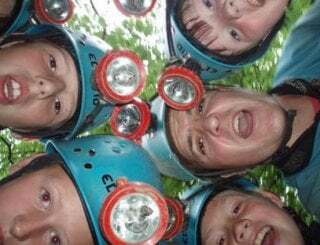 See children's facilities and outdoor facilities. 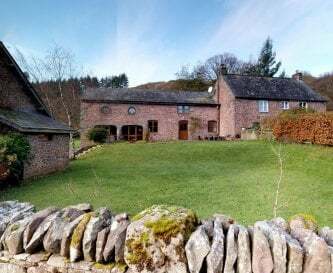 Under floor heating throughout and wood burner in sitting room. 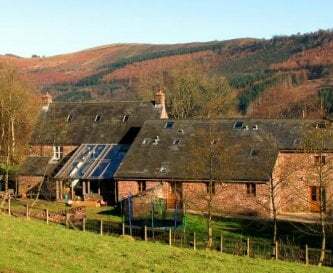 Cost of heating and wood included. 4 bedrooms (3 with mezzanine floors) with a total of 3 double beds and 4 singles plus futons. One child's travel cot can also be provided. All included, plus towels. Please bring bedding for travel cot. 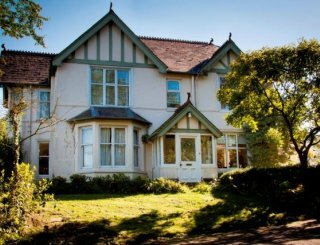 3 en-suite shower rooms with double-sized showers and 1 en-suite bathroom with a bath/overhead shower. 3 separate toilets. Wetroom facilities. Children very welcome. There is a small snooker table and boxes of toys/games. There is also loads of outdoor space to investigate and play in. 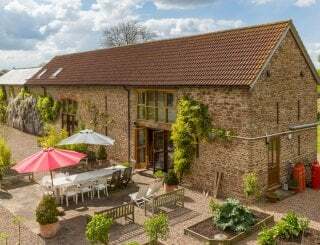 Large rear garden with a trampoline (use at own risk), table tennis table (in adjacent open barn) and paved area with garden furniture and BBQ. We don't have a pool, but in the summer people do relax in the deep rock pools of the near by mountain streams (at their own risk). Ample for at least six cars. Also we can provide covered lock up area for motorbikes and bicycles. Pets welcome on discussion with owners with small additional charge. Please be aware that there are sheep in the surrounding field. 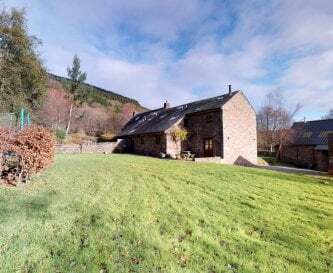 Abercynafon offers spectacular views in every direction and is superbly located in a wonderfully remote yet accessible location. 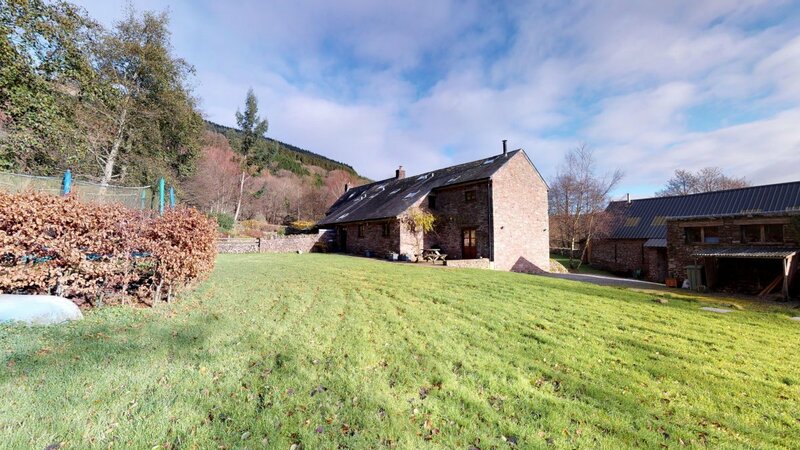 Talybont on Usk village is about 4 miles. Post office/village store/café in Talybont on Usk. 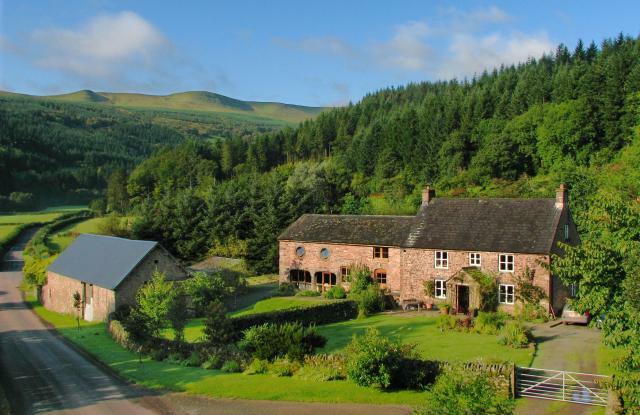 Four pubs and one café in Talybont on Usk. All serve very good quality food. 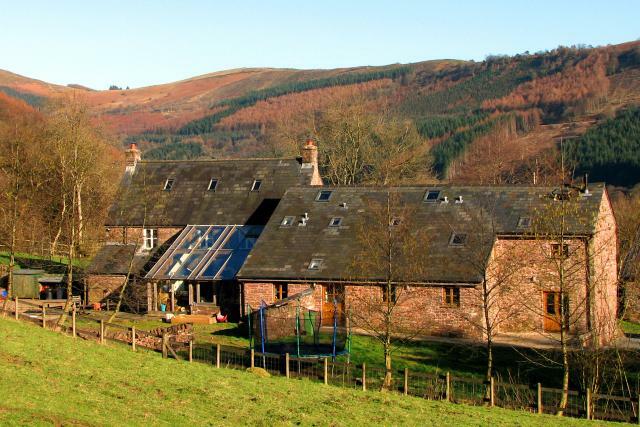 Full week: Friday to Friday, seasonal from £1100 to £1,575. Please contact owner to discuss. 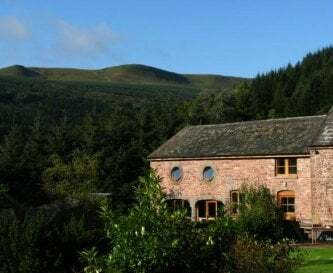 Short breaks: £775 from Friday to Monday (3 nights min.) or Monday to Friday (4 nights). 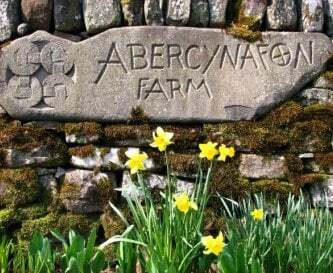 We have availability at Abercynafon farm Barn during Easter week from Monday 22nd through until Sunday 28th April. 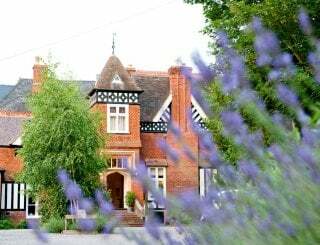 Cost £200 per night. Minimum 3 nights.